There is no doubt that Christmas can be a great time, with lots of family fun, great food, a few drinks and plenty of partying. While all that may amount to an enjoyable period of letting one’s hair down, there is no doubt it can take its toll even on the fittest of individuals. Whether it is the impact of excess alcohol, a few pounds added thanks to the Christmas pudding overdose, or the lack of sleep caused by late nights, many will reach new year feeling somewhat worn down. New year resolutions to give up this, that and the other aren’t really the answer. 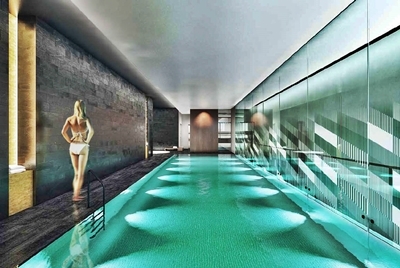 Quite simply, what you need is a nice detox and some lovely spa treatments – and the M by Montcalm Hotel in the Shoreditch area of London is just the place to go. You don’t even need to be staying at the hotel to use the facility, with the M Spa being designed with busy people in mind. A day spent there is all it takes to get those batteries recharged, thanks to a wonderful combination of the ideal ambience and a comprehensive range of treatments, ensuring each visitor can get just what they need to end their visit feeling relaxed, refreshed and revived. Inside, the most striking thing is the decor, with gold leaf tiles and a general serene air of blissful relaxation. Here you will find the pool, jacuzzi, sauna, steam room and the experience showers, all designed perfectly to provide a great experience. With a highly-trained team of therapists on hand with leading organic spa treatments and three rooms to carry them out in, you can feel utterly pampered and will feel that stress draining away. If you fancy a good work-out afterwards, there is a state-of-the-art gym with satellite TV and Wi-Fi.Quite simply, the M Spa is an oasis of calm in the busy city, a place where you can have your batteries recharged. A decision to visit there in January could be one of the best new year resolutions you make.